Hello from the Fox Federation! Join our mailing list and gain access to free flipcharts, planning and resources for Place Value and Fractions, designed to get your maths teaching off to a great start. Please enter your details below. A download link will be emailed to you instantly. Please check your junk mail if you do not receive the email within a few minutes. Please confirm you wish to opt into our mailing list to receive the free resources. We will continue to send relevant emails with further resources and related courses. You can opt out at any time. One of the aims of the Maths Hub programme is to improve the quality of curriculum resources and activities, especially to support mastery teaching. The link to the resources mostly follow the structure of Practise, Use and Apply followed by Reasoning. Within the Practice part of the activities teachers try to make these progressively more difficult for example by equations including 0 or by crossing a boundary. They may also require children to use the inverse operation to solve. For the Use and Apply activities teachers provide opportunities for children to use skills and to apply knowledge in a different context for example statistics or measure. Reasoning examples can be found in the NCETM Reasoning documents or in the similar 'levelopaedia' documents on the Kangaroo Maths website. mathematics and provide proof of mathematical ideas, relationships or structures provide pupils with experiences of early algebra. Asking pupils to talk about what they notice about the mathematics they are learning and to consider whether it will always happen and if so why, moves pupils towards generalising about the mathematics. It is important to note that this pedagogical approach to teaching mathematics is embedded alongside the flip charts we have provided. The ability to visualise key structures such as those within odd and even numbers or an understanding how operations combine and relate to each other are examples of key structures and relationships in number and we have explored this within the flip charts provided. The relationship between doubling and halving and opportunities for exploring factors and multiples are further examples of key ideas for which resources are provided. Lessons on commutativity and equivalence are also explored. An awareness of pattern and structure in very young children is an indicator of competency with number. (Mulligan and Mitchelmore 2009, 2011) Simple sequences with colour or clapping and clicking a rhythm are examples of early algebraic exposure that support children in understanding structure and pattern. 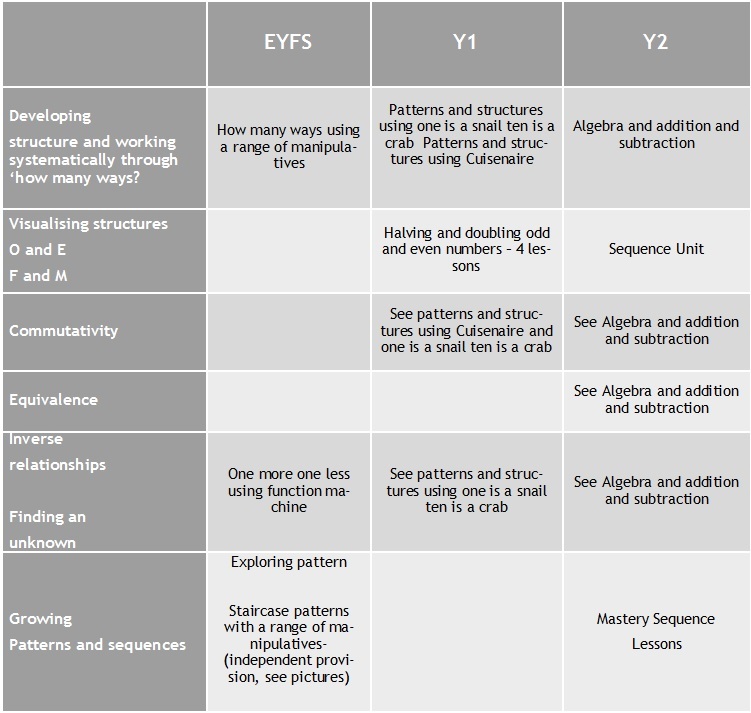 Planning and flips related to growing patterns and sequences feature across all year groups. These FREE resources made by Fox Primary School, through London Central and West Maths Hub, give you detailed plans, resources, flipcharts and sometimes videos for each year group on Algebra (Reception to Year 6). 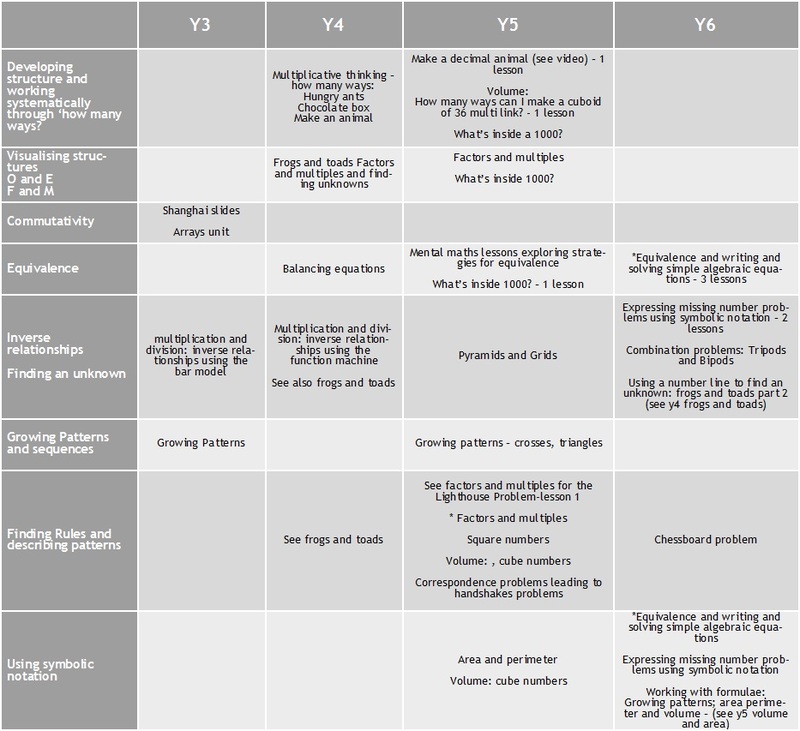 There is a table which provides an overview of the key concepts and ideas explored according to year group, although we suggest you could adapt these resources for your year group as appropriate. Please fill out the form bellow to receive a link to the Cuisenaire Resources.